Would anyone be interested in a Clasheen style felting workshop in Kentucky sometime during the last weekend in May??? I was very excited to get an email from fibre artist Jan Durham this weekend and we have been chatting over the last few days about the possibility of organising a get together in Kentucky after my workshops with Dawn in Michigan and prior to my return flights home to Ireland. It would be WONDERFUL to add a new venue to my American adventures so if you are interested in meeting up sometime between Friday 27th and Tuesday 31st May and having a fun time felting together please email Jan today to have a chat! Kentucky is not a state that I have visited before and what nicer way to make an inagural trip than to meet up with and share time with other felt and fibre friends!!! The weather is extremely cold and windy this morning but the biggest plus is the fact that our horrendous rain from yesterday and last night has finally stopped! 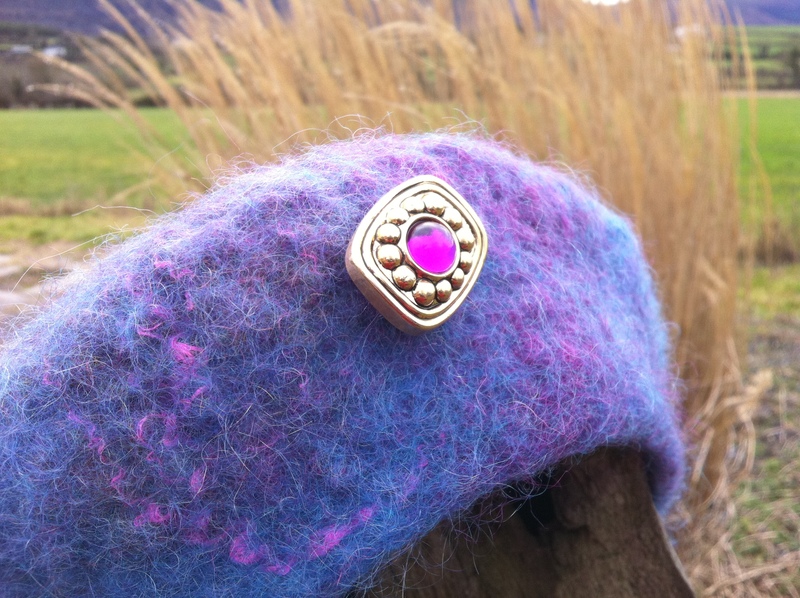 I grabbed the chance to take another few pictures of the felt beret I made and here is one showing an accurate representation of the beautiful heathery colours and textures. I have fallen in love with the possibilities of combining the mohair waste with other fibres and hope that the ladies of Borris Active Retirement feel the same way today when we explore the potential of simple felt hats. During my trip to the States in May I am thinking of offering my house and studio to an artist who would like a peaceful rural retreat in which to concentrate on their practice for a month in exchange for providing company and walks for Rex, my canine friend! Obviously Clasheen is perfect (if somewhat untidy at times!) for a felter or textile artist but it would also suit a writer, painter, photographer (wonderful scenery locally!) or indeed any creative person who would like the space to concentrate on their work whilst having all the amenities of a small town 6 minutes drive away. If you know anyone who is reliable, flexible and loves sheepdogs who might be interested in living here during the whole of May please pass on this information and ask them to email me asap! I would also be happy to consider a person or couple interested in basing themselves here for a month rent free especially if they were happy to do a little gardening or painting in exchange for accomodation in a traditional Irish farmhouse coupled with peace and quiet! Rex is my main priority however so whoever is interested in the possibility of using my studio facilities and/or house must be a dog lover and will need to commit to looking after him for the duration of my trip abroad. This entry was posted in America 2011, Felt, workshops and tagged Felt, felt beret, felt workshops, Felting, felting workshop, felting workshops, Kentucky, merino, mohair, silk, wool by Nicola. Bookmark the permalink. What a wonderful trip you are planning. Kentucky is beautiful. Felting & travel…Great combination. That will be so nice for Rex to have live-in companions while you’re away…I’ll bet you’ll find a great match…Such an offer for someone! When I retire I will be looking for opportunities exactly what you’re offering. I am presently a Handwork teacher in a Waldorf school. I don’t have a big income, I love to spin, knit, felt, sew and would love to see some more of the world. So in a year or two at the most, I’ll be available. Keep me in mind. I also love walking and some dogs too! Good luck with your project. The beret is beautiful. ps. I live in Quebec where we are buried in snow at the moment, so January, February and March would be great times to visit a more gentle climate.